This Outlet Thermostat offers the comfort, convenience, and energy saving benefits of full programmability. 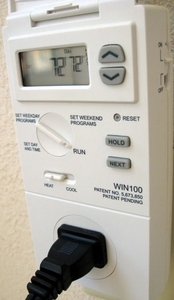 To use, just plug the into an outlet, plug your cooling unit into the thermostat, and you're ready to go. This Model offers the convenience of 5-2 day programming so you can create different programs for weekdays and weekends. This Model can also be used for Portable Air Conditioners and Heaters.